Animated Film Reviews: Cloudy with a Chance of Meatballs 2 (2013) - More Fun for Flint and Sam! 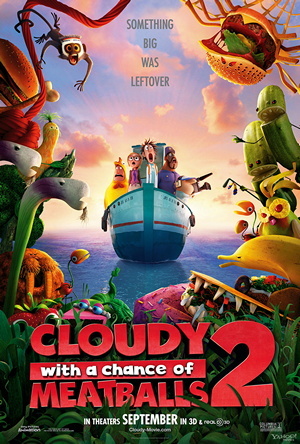 Cloudy with a Chance of Meatballs 2 (2013) - More Fun for Flint and Sam! Get Ready for Leftover Food Fun! The sequel to the hit Sony Animations animated film "Cloudy with a Chance of Meatballs" is coming, and once again it involves food! Many of your favorite characters return to partake in Flint's wild inventions. Below are trailers for the film, scheduled for US release on September 27, 2013. Once again, it stars Bill Hader, Anna Faris, James Caan, and Neil Patrick Harris as residents of that food-challenged community, Swallow Falls.